Hurricane Harvey Flooding Uncovers Secret Stash of Obama Administration Ammo-Fiction! - Truth or Fiction? Hurricane Harvey flooding led to the discovery of ammunition that the Obama administration hid in a small Texas town called Lexmar. 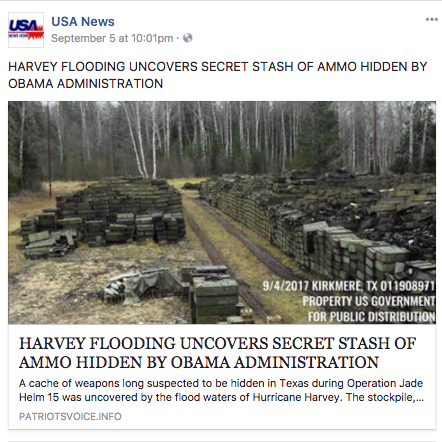 False that the Hurricane Harvey flooding led to the discovery of ammo stashed by the Obama administration in Texas are based on a misidentified photo of an ammo stockpile in Russia from 2011. The report appeared at the website PatriotsVoice.info under the headline, “Harvey Flooding Uncovers Secret Stash of Ammo Hidden by Obama Administration,” on September 4, 2017. A fake news report that Hurricane Harvey flooding revealed ammo stockpiles hidden by the Obama administration surfaced in September 2017. The questions that do remain will have to be answered. There are 180 million rounds of ammunition out there that could be slated for use by an invasion force led by Barack Hussein Obama. He has almost a billion dollars worth of weapons and equipment. Having stockpiles of automatic rifle ammo, hand grenades and mortar shells dispersed around the country would come in awfully handy in an all-out ground assault. Attorney General Jeff Sessions said that the stockpile is being carefully inventoried to try to establish a chain of custody. U.S. Virgin Islands Governor Signs Order to Seize Guns Ahead of Hurricane Irma-Truth!